This has brought quite the mixed reaction; laughter bordering on tears when O-Dogg explained to our boss what they were… my friend Leah betting me that I wouldn’t wear them out to a bar… sheer excitement from a couple of (very) young ladies when they saw I had them on… my brother calling them Aqua Socks… like I said, a bunch. But the biggest reaction I get, BY FAR, is questions. I get a ton of questions about them. So, I figured the best thing for me to do is answer them… here. This way, I don’t have to keep answering them all the time – I can just send people here and have ’em read away! ARE THEY COMFORTABLE? This is an impossible question for me to answer for someone. I have absolutely no idea what you define as ‘comfortable’ so how can I say if they will be for you? Here’s what I can tell you – I HATE SHOES. I walk around barefoot as much as humanly possible. 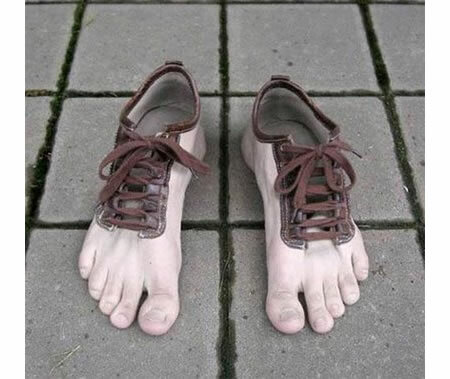 I also have very wide (4E) feet, so finding shoes that I consider comfy is no easy task. Take those two factors into consideration and I LOVE MY FIVE FINGERS. I wear them all day… when I put them on, I leave them on… and, for me, that is something that never happens. Getting used to them while running, however, is a whole different task. This isn’t buying a new pair of kicks and breaking them in. You use a whole different set of muscles when running in these… and you have NO idea what a calf workout is until you run in these. My calves hurt SO bad the day after I ran in them the first time, and that was only after running in them for about 15 minutes – and after a week of walking in them. So, if this is something you look into – you absolutely need to make sure you a) give it time (my suggestion would be at least 2 straight weeks or working out in them), and b) read up on the right ways to get started in this type of running. ARE THEY EXPENSIVE? This is one of the biggest surprises of them all, because there isn’t some crazy new kinda technology behind this phenomenon. No – they are not expensive at all. 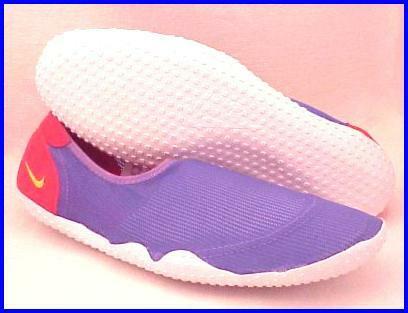 The Five Fingers are a very minimal shoe (not a ton of padding, bells and whistles, etc.) and will run you $80-$100 which isn’t exactly chump change but, for a running shoe, would be considered middle-of-the-pack price wise compared the full line of running shoes available. OK, SERIOUSLY… WHY DO THEY LOOK SO WEIRD? 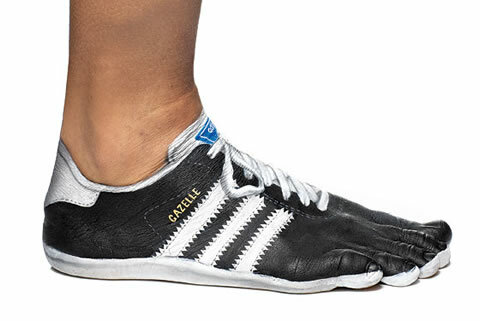 Well… for those of you who don’t want to have awesome-looking ninja shoes like me, most of the major brands have come out with their versions of barefoot running shoes that look like regular shoes. However, I would argue that I’m not really sure you get the same out of them that you do the Five Fingers… and and that’s simply by looking at them and the amount of sole (padding) they have on them. Prices are also reasonable, but do vary by brand. 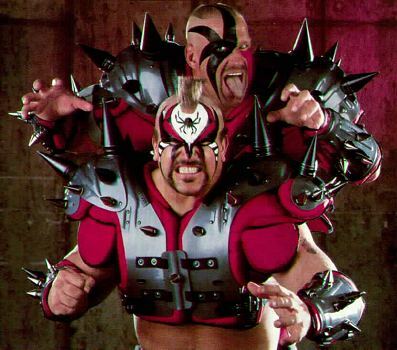 DO THEY GO WITH YOUR OLD-SCHOOL WRESTLING COSTUME THEME FOR THE MUDDER?!?! 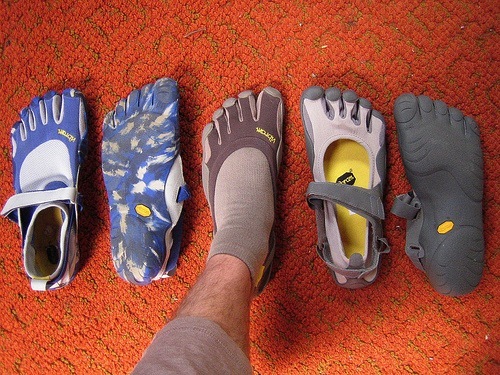 I’M NEW TO RUNNING LIKE YOU – CAN I BAREFOOT RUN? Here’s what I’ll say about that – EVERYONE is technically a novice when it comes to this kind of running, so it doesn’t matter how long you’ve been running or how many marathons/ triathlons you have run… this is brand new to A LOT of people. So don’t worry about your skill level – just get started. Yeah, it’s gonna be weird, and sore, for a bit… but once you get through it it actually feels pretty great. That is the vast majority of questions I get, so I hope this helped you out a little. I personally love my Five Fingers and would suggest them to anyone – as long as they understand why they are really trying to use them. If you have any more questions for me… hit me up here, on Facebook or the Tweet Tweet machine (BTW – get on Twitter… it’s way better than Facebook) and I’ll be happy to help. It’s just been a VERY long time since I last wrote and, as I’m sure you can imagine, I haven’t been doing as well as I had wished with everything. It’s been a REAL struggle getting back on the saddle, but I am using the 6 month mark as my re-introduction to taking care of myself so to speak. I have been running in my Five Fingers more and more… I’m up to a mile running coupled with a half mile of walking. Still trying to ease into it. I run in them 3 days/ week and they are gradually getting more comfortable. I will be doing a future blog about barefoot running and the benefits/ drawbacks because a lot of people have been asking. Lord knows I am no expert, but my average guy insight will hopefully be helpful. The Mudder – as of today, it is exactly 6 months away!!! Right now, STILL only two other people have definitely signed up (Scotty T and O-Dogg) but I’m hoping that many of you hold up your promises to me and get signed up ASAP. I know my bro hasn’t signed up yet, but he’s gained back his chiseled Adonis/ freak-show body again in preparation so at least he’s getting ready! As for the rest of you… WHAT THE HELL ARE YOU WAITING FOR??? If this were Twitter the hashtag would be #TimeToStepYourGameUp. Also, the rumor is that the Mudder is… wait for it… getting TOUGHER than the original 8-mile, 18 obstacle fun-fest it was originally set up to be. WOO HOO!!! Speaking of the Mudder… this year, on behalf of my participation in the Tough Mudder, I have agreed to raise funds for the Wounded Warrior Project. It’s really an amazing cause, so I give you fair warning that you will be seeing posts/ emails/ etc. soliciting taxable donations for this truly wonderful cause. You don’t have to raise money to compete in the Mudder… I chose to, because I wouldn’t be doing this type of thing without the men and women this foundation supports fighting for my freedom to do so. Seems like the least I could do. Hit a little speed bump health-wise – I was diagnosed with a hiatal hernia several years ago, and some of the symptoms that I was experiencing years ago started creeping back up recently which helped me decide to get a follow-up. That follow-up led to my 2nd endoscopy (it’s as awesome as it sounds… trust me) and this wonderful diagnosis: No more spicy foods, citrus or alcohol if I want to keep my stomach, my throat… and my teeth. Not ‘in moderation’… Stop it. Period. Another major cause for the symptoms? STRESS. Yup, my stress level causes the hernia to go into overdrive in the acid producing department so I need to learn to CALM THE EFF DOWN AND RELAX! So this is where you come in… I hope! For the next 6 months (at least) it’s going to FINALLY be all about me. I was there for a while, fell off that wagon… HARD… and am trying to get back on it and stay on it. What does this mean exactly? Simple: Any person, place or thing that gets in the way of me taking care of myself – you’re gone… See ya… A PEEAAACCCCEEEEE OUUUUUUUUUT (always love throwin’ in a DJ Kuba reference). It’s nothing personal… actually, I take that back. It’s 100% personal, and I’m totally OK with admitting it. I just need to get back to the things that were making me happy a few months ago… Like working out, eating right and not feeling sorry for myself. And you guys that read this blog were a huge part of that! I loved hearing from you, encouraging you, having you encourage me, etc. and hopefully I haven’t lost you all yet. So keep on me! You know, like Jess, who asks me weekly about my blog and why in the eff I haven’t been writing, thus making me feel guiltier and guiltier for not writing one. And Jean who messaged me and, because I was so heart-broken that I was letting her down because I was such in a rut and not doing what I had been doing, have been terrified to write back. From here on out, it’s a blog/ week until the Mudder. It’s getting back in touch with ALL OF YOU. Daily workouts, strict eating habits (no cheat days b/c it’s not cheating anymore, it’s normal! )… all of it. Seventy pounds in 6 months – 12 pounds/ month from here on out!!! 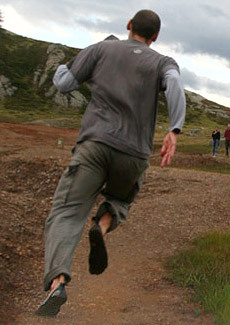 You are currently browsing the Blubber To Runner blog archives for April, 2011.